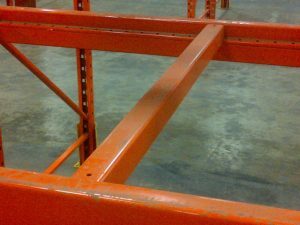 Safety Bars – Canadian Rack Inc.
Safety Bars are vital component for a safe pallet rack storage system. Safety Bars prevent misplaced pallets from accidentally falling through the horizontal beams in a racking system. 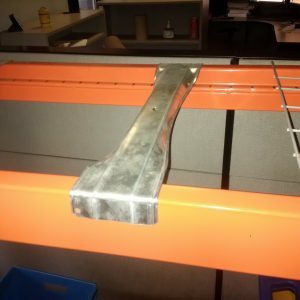 Safety Bars are also sometimes referred to as Cross Bars, Skid Supports and Pallet Bar Supports. Pallet support bars are a small investment that can greatly improve the safety of your operation. As part of a complete racking solution, they offer peace of mind and performance you can count on to keep your crew and product safe. Improved productivity – When employees have to take extra steps to ensure safety, it cuts into the time that could be spent stocking shelves or picking an order. Lower liability – On-the-job accidents cost time and money. When you make security a priority by purchasing an appropriate racking system, you reduce your liability. Properly secured and supported pallets also make it easier to meet applicable health and safety guidelines, and to maintain compliance with ISO and other standards. Less product loss – Every year, warehouses lose sizeable amounts of inventory due to preventable accidents. Better racking systems equipped with appropriate pallet support bars are your first line of defense against avoidable and expensive incidents.